Retired NFL running back Reggie Brown speaks to Trenton students. PRLog (Press Release) – Feb. 3, 2014 – TRENTON, N.J. — Local nonprofit Minding Our Business (MOB) introduced former Philadelphia Eagle running back Reggie Brown to hundreds of Trenton middle schoolers at a January 28th assembly last week, and the children walked away with an important lesson in listening. The event served as a kick-off to MOB’s 12-week after-school service learning program for Trenton students, which focuses on experiential learning and entrepreneurship, and begins on February 4th. The program will be run throughout the spring in Luis Munoz-Rivera Middle School, Joyce Kilmer Middle School, P.J. Hill Elementary School and Village Charter School. In a school wide assembly and later via small group sessions throughout the morning, Brown, teachers and other MOB partners emphasized the importance of paying attention, and benefiting from positive mentors and opportunities. Speaking to the sixth-to-eighth grade students at Luis Munoz-Rivera Middle School, Brown described his childhood in Newark, NJ, and how he refused to let a badly injured back stop him from playing football in college and the NFL. He described how he left Newark for sunny California; attended Pasadena City College (where he “broke all of sports great Jackie Robinson’s football records”) and the University of Oregon; and was drafted to be a running back for the Atlanta Falcons and finally the Philadelphia Eagles. 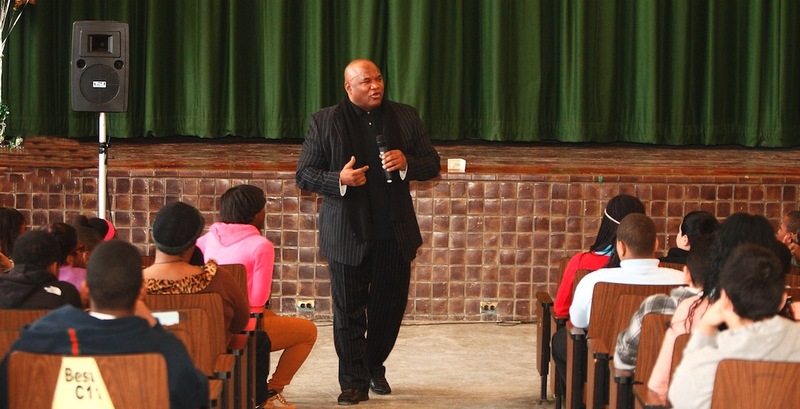 Having retired from the Eagles in 1987, Brown is now an activist, entrepreneur and motivational speaker – inspiring young people to see beyond the confines of their current situations and believe in their dreams. He has addressed over 50,000 audience members in more than 12 states in the last 20 years. Having trained and mentored more than 2,500 Trenton middle school students in starting and running their own businesses since 1997, Minding Our Business is committed to helping urban students identify and work toward their dreams. Now celebrating its first year as an independent 501(c)3 organization, MOB currently operates a variety of after school and summer educational and mentoring programs focused on entrepreneurship and experiential learning. Each MOB program emphasizes business training, as well as math, reading, communication and life skills. “MOB and Reggie’s story can both help you realize that, no matter where you come from or what you’ve been through, you can be successful if you are determined to be successful!” stated local businessman and MOB Chairman Tracey Syphax, when he first introduced Brown to the students. For further information about Minding Our Business, and/or to donate to support its efforts, please visithttp://www.minding-our-business.com or call Executive Director Kevin Wortham at 609-731-9311.